During 2011 I was able to visit Riyadh in Saudi Arabia on business, which is probably the only way I would be able to do so. Long queues for immigration and then into town. Massive suite in the Hotel Mena, but only Seven-Up or Diet Coke in the evenings to go with the massive meat-feasts. You barely see women here, and certainly have no interaction at all. Managed a couple of walks around the area near the hotel. There are some nice modern buildings and some older mosques. 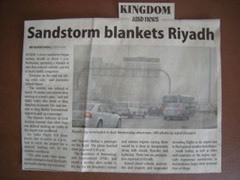 On one of my visits there was a massive sandstorm, and on the next it rained and the place flooded. 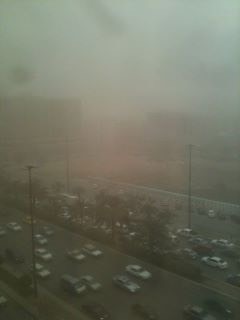 Picture from the office window.